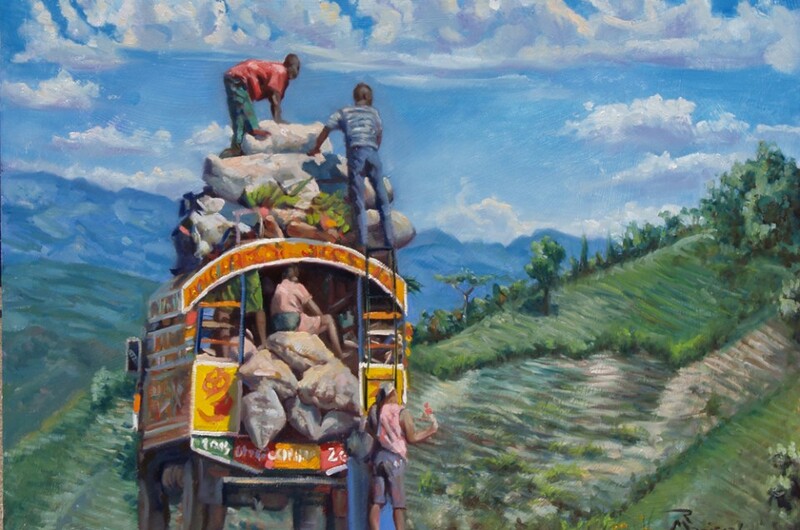 Renown Charleston artist, Robert Maniscalco, has received funding to create an exhibition of paintings, expressing hope and renewal from a Vision Trip to Haiti, in partnership with Water Missions International. The first phase of The Quench Project is now complete. Robert Maniscalco, best known for his distinctive commission portrait work, initiated a Kickstarter campaign, which ended August 31, 2014, raising $4,100, surpassing the goal set for The Quench Project. The funds will enable him to go to Haiti in the next couple months, where he will interview, sketch and photograph Haitians engaged in the process of survival to create a series of paintings that express hope and renewal. 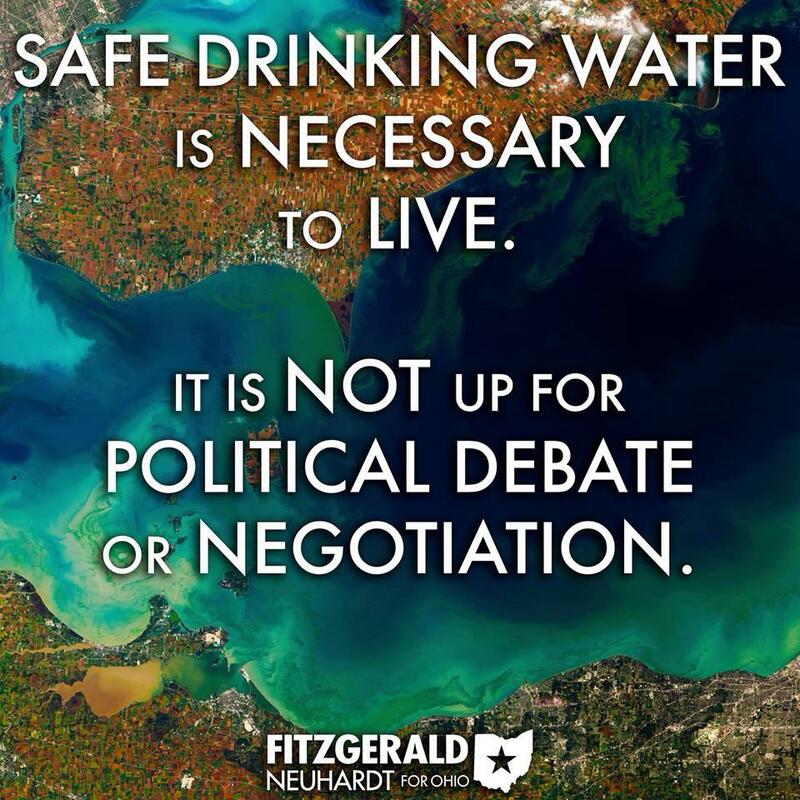 These will later be exhibited in venues in Charleston, such as The Mary Martin Gallery and other locations like Detroit and other centers where water use has become an issue. The purpose of the exhibition will be to create awareness around the water crisis many are facing in the world right now. 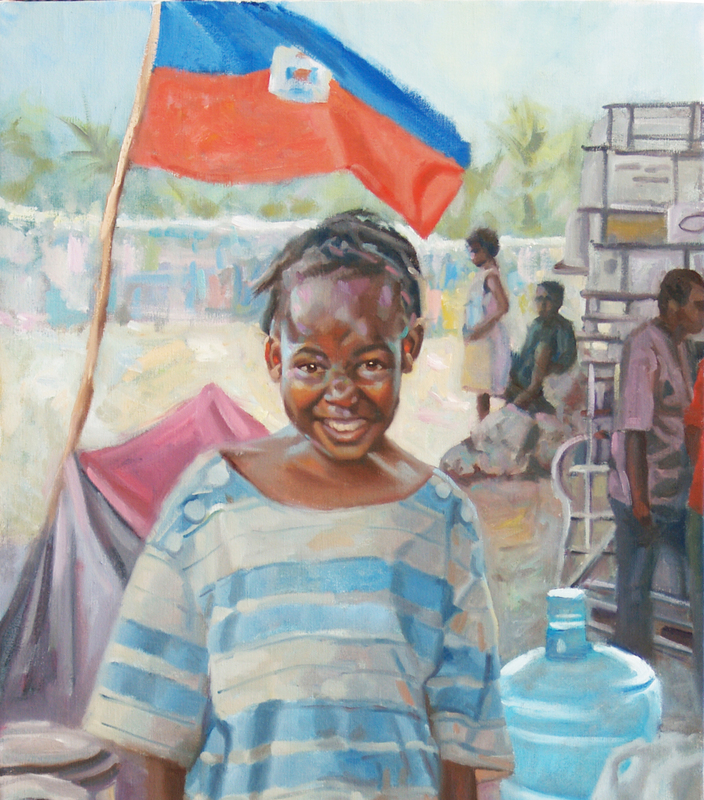 Here is the link to the successful Kickstarter his campaign: https://www.kickstarter.com/projects/1258824272/the-quench-project-in-haiti-paintings-of-hope-and. It is not too late to contribute! In the next couple months, Robert will take a Vision Trip to Haiti lasting 7-10 days as part of the Water Missions International (“WMI”) team. Transportation and other expenses will be paid for by this successful Kickstarter campaign. In Haiti, he will assist in the WMI missionary work to process and bring fresh water to areas still devastated by the earthquake and water shortages. 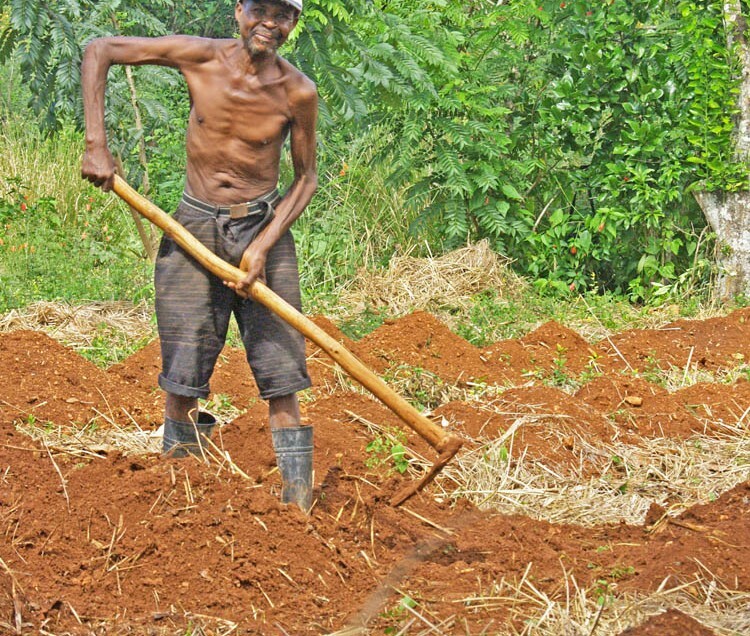 Robert’s food and lodging while in Haiti will be provided by WMI. There he will take photos, make sketches, interview Haitians who are finding creative ways to thrive under difficult conditions. 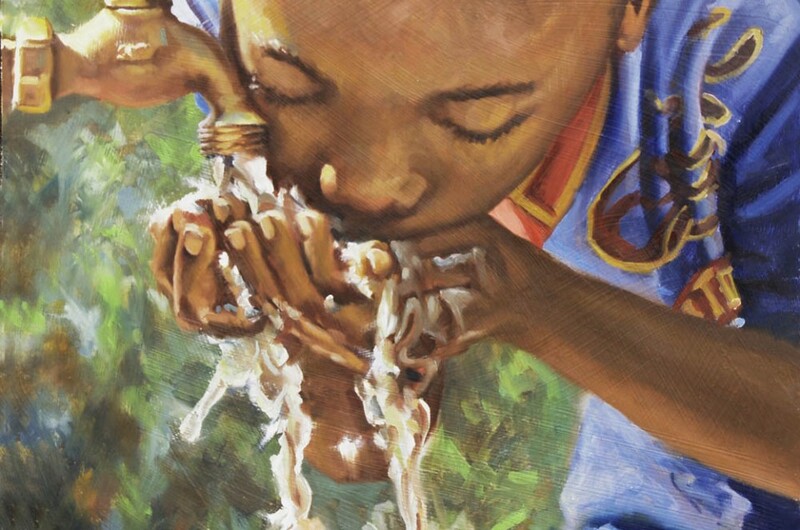 He will gather this written and photographic reference to create an exhibition of 10-15 paintings for a traveling exhibition called “The Quench Project,” focusing on the impact of WMI’s living water message and world-wide relief efforts. A portion of the sale of art will go to WMI. The exhibition will be a call to action for the continued need and awareness for WMI, a Christian-based non-profit organization, who have invented a unique water purification system, dedicated to bringing fresh water to remote areas around the world. Visit http://www.watermissions.org/ for more info on their powerful mission. The primary intention of the The Quench Project is to raise awareness of WMI’s mission and generate funding for their continued missions all over the world. “Christelle,” created in 2012 (below), is the prototype for The Quench Project, and is part of the WMI permanent collection. A larger goal for the project will be to raise awareness of the world water crisis related to a growing population, a disparity of wealth and the effects of global warming. Robert will create a touring exhibition. WMI will also provide an exhibition and launch event in their facility for special invited guests. Then the work will be exhibited in a variety of venues, including The Mary Martin Gallery in Charleston. These exhibitions/receptions/openings/events will be an opportunity to spread the WMI message to new audiences, as well as advance the power of art and creativity to create awareness and build bridges between people. A full color catalog/booklet will be created with reproductions of the images, along with the story surrounding each story he tells through his paintings, along with his personal responses and impressions of the experience, inspired by the WMI vision. All contributors will receive an inscribed copy of the catalog. Before the one year exhibition period, which will begin six months after the trip, certain kickstarter contributors will receive first choice of an original painting created for the Quench Project Exhibition. The remainder of the exhibition’s originals will be priced between $2,500 and $8,000 and will be for sale during the touring exhibition.